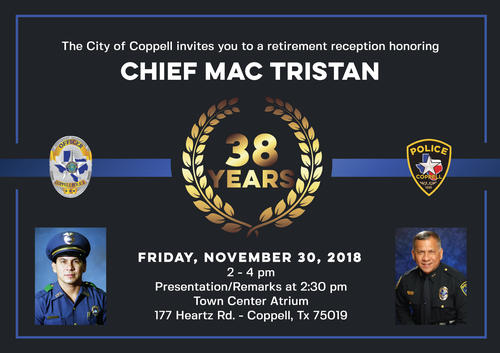 During the reception, attendees will celebrate Tristan’s many accomplishments and thank him for his dedication to the safety of Coppell’s residents. Tristan was sworn in as Coppell’s Chief of Police in January 2011. He came to Coppell after serving more than 29 years with the City of Carrollton Police Department. Tristan has worked with several external businesses and community organizations throughout his time with the City. All are invited to attend the reception.